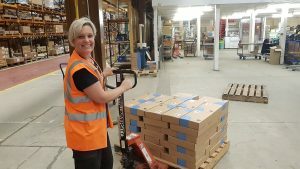 Wellingborough, the first and now the last remaining warehouse of the OU illuastrated by a man heaving parcels onto a conveyor belt almost half a cerntury ago and, more recently, a woman and a for-lift truck. From its earliest years industrial-scale processes were central to the OU. It was built on the assumptions of mass production. In 1969, as the OU was opening, the government presided over the opening of Longbridge, the biggest car plant in Europe. Other universities of the 1960s saw themselves in the tradition of communities of investigative scholars. Sussex, for example, was called Balliol-by-the-Sea. However, the OU has been described by one of its first deans as ‘an industrial revolution in higher education’. It was built on industrial precedents, and this is reflected in the language developed by its early staff, with ‘lines of study’ and the ‘production’ of ‘units’ of teaching materials. Greville Rumble, who joined the OU in 1970 and was head of the OU’s corporate planning of ce in the mid-1970s and also in the late 1980s, suggested that ‘during the 1970s industrialisation came to be seen by many as a defining feature of distance education’. Two of the OU’s first deans stressed both the egalitarian ethos and the use of a systems approach at the OU. The concept of a ‘system’, a term which, along with the phrase ‘evidence-based policy’ was part of the lingua franca of the period, indicated the ambition to combine academic enquiry with assembly-line manufacture techniques to create educational materials for mass consumption. In its first year the OU sent out 2.7 million mailings, including 33,000 home experiment kits. The students completed about 320,000 assignments: half of these were marked by tutors (Tutor marked assignments) while the other half were marked by computers (Computer marked assignments). The administration of just one OU Social Sciences module involved some 22,000 applicants, nearly 8,000 enrolments, 85,000 essays which required assessment by hand, 64,000 assignments marked by computers, 24 summer schools in five different locations, 300 study centres and over 1,000 part- time tutors. The logistical difficulties of supplying a wide range of learning materials to each student is illustrated by Lee Taylor, who recalled that ‘we had to scour London trying to find cardboard boxes of a suitable size for sheep’s brains. Eventually we found a place where I purchased something like 500 boxes, which said ‘Chanel No 5’ on them.’ Early accounts of the OU often noted its sheer size and scope. The first Dean of Social Sciences,Professor Michael Drake, referred to ‘the numbers that numb’. 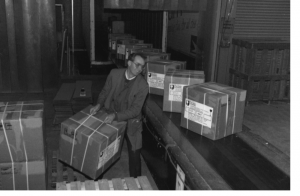 Bletchley Post Office was overwhelmed by the correspondence so Post Office staff worked on the Walton Hall site and dispatched items directly to the railway station. 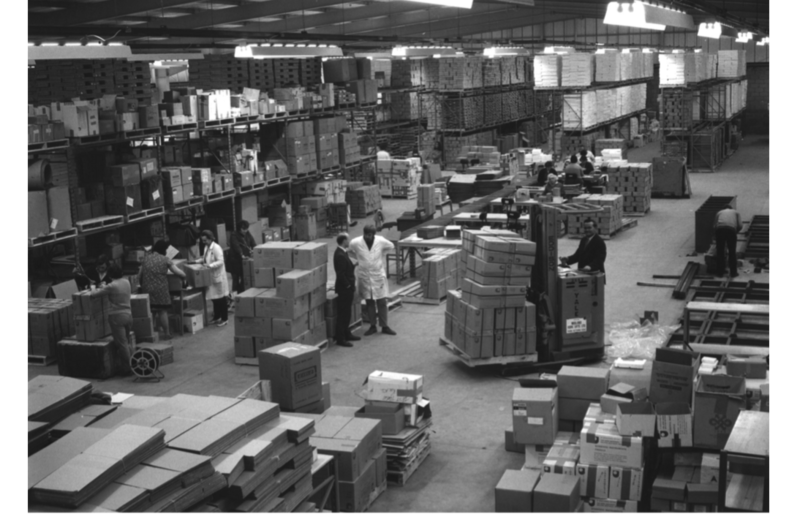 In 1971 that a warehouse was acquired, at Wellingborough to deal with the need to supply thousands of students with books and equipment. This entry was posted on Sunday, September 9th, 2018 at 12:01 am by Daniel Weinbren	and is filed under 50 objects. You can follow any responses to this entry through the RSS 2.0 feed. You can leave a response, or trackback from your own site.